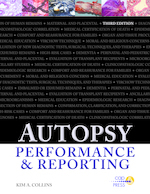 Autopsy Performance & Reporting is a highly illustrated text is for seasoned autopsy pathologists and those who may not perform autopsies on a regular basis. Divided into six sections, contents include an introduction to the autopsy, preautopsy and administration, autopsy safety, autopsy performance, reporting, and quality. The text emphasizes safety, specialized autopsies, and procedures for specific organ systems and patient populations.